Whatever questions you have about house cleaning, organizing, and decorating - or anything else related to keeping your home running like clockwork - the house cleaning forum is the place to ask them. Have a cleaning or organizing tip that's worked wonders in your home? You can also add comments or answer questions - no registration or member login required. The house cleaning forum is the place to help and be helped - so if you've got some great cleaning tips, inexpensive decorating ideas, or organizing solutions - please share them too! Everyone has a housekeeping dilemma at some time or other. What's yours? Do you have a cleaning or organizing question that has you stumped? Perhaps a unique tip that has worked well in your home? Ask it or Share it here! Enter Your Question or Tip Here. Your question or tip will appear on a Web page exactly the way you enter it here. You can wrap a word in square brackets to make it appear bold. For example [my story] would show as my story on the Web page containing your story. Do you have some pictures to help illustrate the problem or solution? Great! Click the button and find the first one on your computer. Select it and click on the button to choose it. Recommend Some Good Cleaning Supplies? How to remove stains from unsealed sanded grout? How to clean tile floors without just moving the dirt around? I mop my tile floor but unless I use a towel afterwards to dry it, I'm just moving the dirt around. Any suggestions? Bathroom rust stains that won't go away! Please can you suggest a way of removing the clear hard/soft/sticky innards of a stretch Armstrong from a wood floor? Cleaning trick: Make it hydrophobic ? How do you get rid of cigarette smell in a home? Is there any fix for discolored oven racks? How Can I Get Rid of Washing Powder Stains on Clothes? I put my blouse too close to my gas heater and now some of the fabrik burned on to it. How do I clean it? Did you know that newspaper or coffee filters work great for cleaning glass and mirrors? They are lint free. I'll never go back to paper towels again! Can this be cleaned? If so how? Help! My husband decided to brighten up our stained kitchen cabinets with Linseed oil. (Why not, he uses it on his boat) The results are a sticky mess. Our closed up homes during the flu season makes them incubators of germs and viruses. 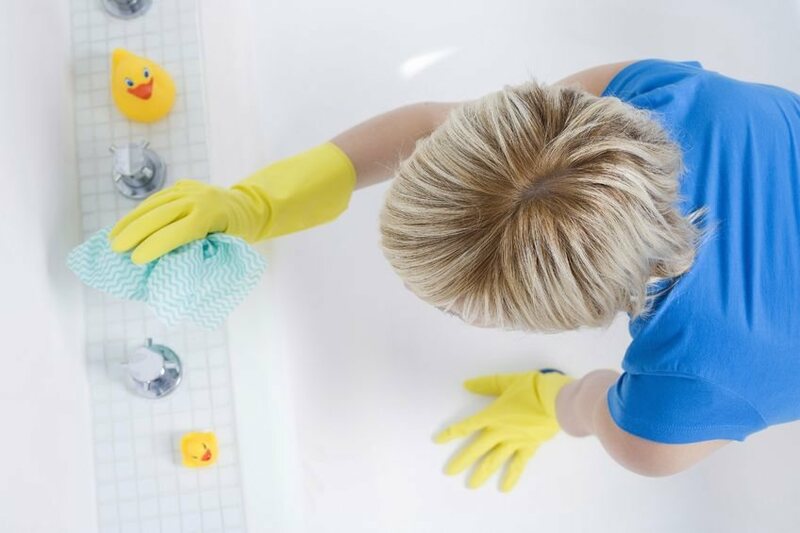 These 9 flu prevention cleaning tips can help your family stay healthy.